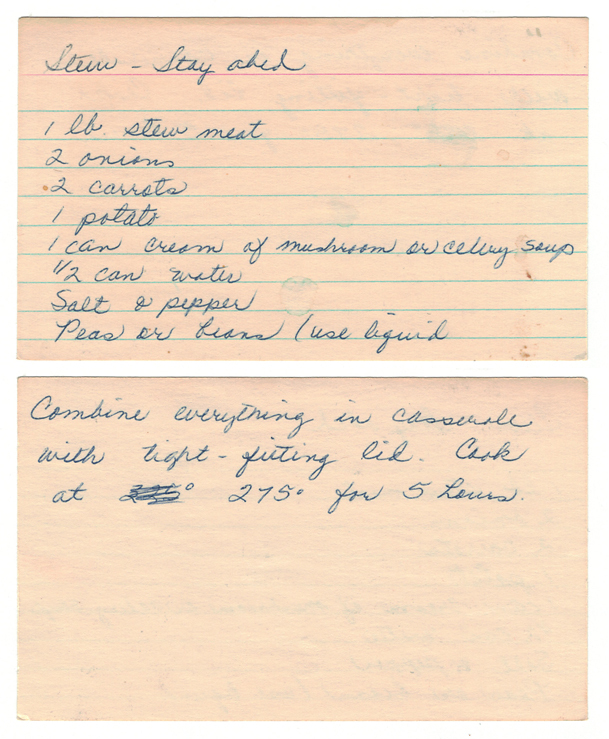 When I saw the recipe card below, I stared at it for a few minutes trying to figure out what Mom had written. After doing a Google search I learned that in fact there was something called “Stay Abed Stew”. 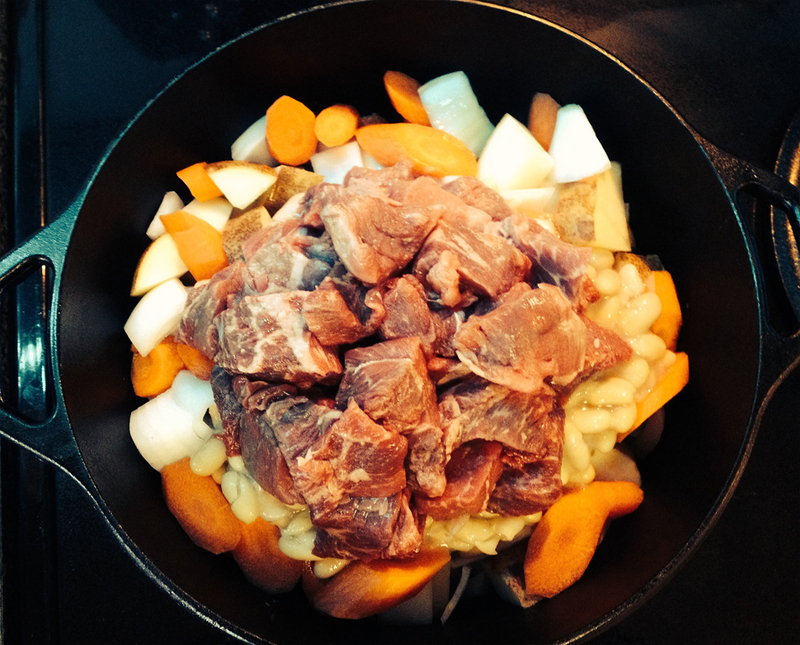 Something that has been extended by some to be called “Stay In Bed Stew” as it turns out it’s so easy to make. I prefer the Stayabed name. 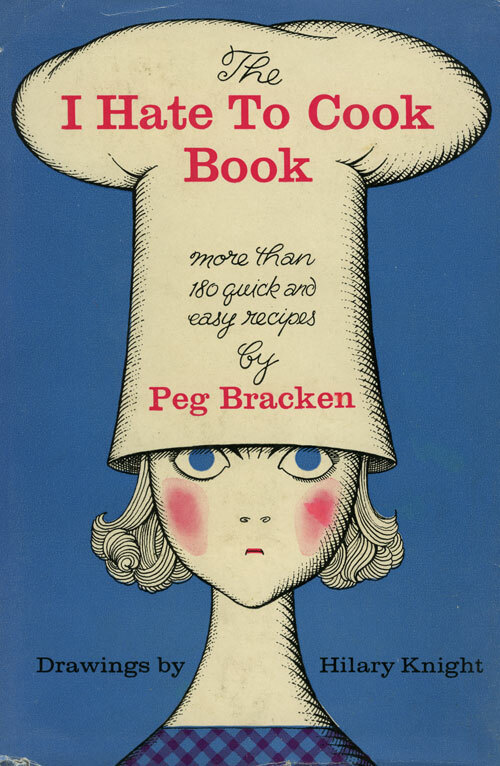 I learned that this recipe originated from the “I Hate To Cook Book” written by Peg Bracken in 1960. The book was made for everyone, men and women alike, who want to get from cooking hour to cocktail hour in as little time as possible. I learned a little bit about Peg and she was a copywriter at an ad agency. I would have loved to meet her as I’ve worked with many writers in my days in the ad agency world. Peg wrote that “Stayabed Stew” could be left to cook by itself and was perfect “for those days when you are en negligee, en bed, with a murder story and a box of bonbons, or possibly a good case of flu”. What’s not to love there? Despite the slow-cook process, the dish was totally easy to make and very tasty. Thank you, Peg, for showing us that speed and sustenance – above all – are golden. ♥ I’m pretty sure I forgot to add the ½ can of water; make sure you do this to give it a little more juice. 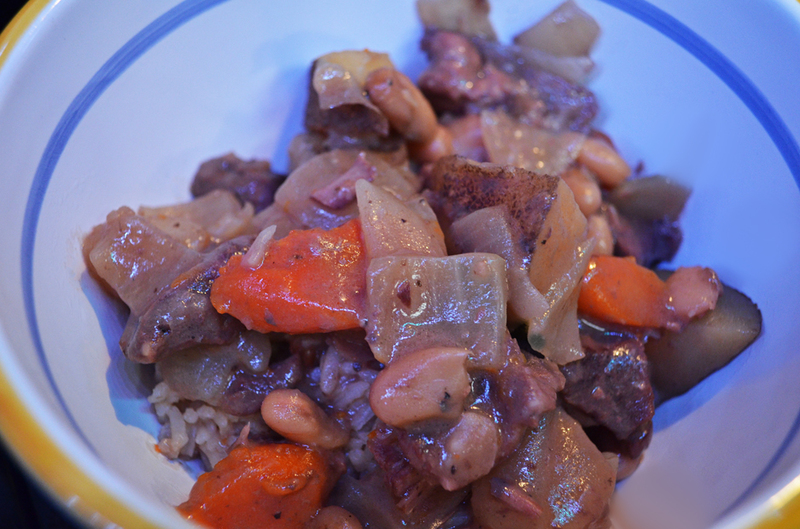 ♥ My interpretation of this dish involved using cannellini beans, 3 carrots and a russet potato. Delicious. ♥ If you decide to use peas vs. beans I saw an online post where someone said they added the peas during the last 30 minutes of cooking to avoid them being “mushy.” Seems legit. 0. Preheat oven to 275°F. 1. Combine everything in a casserole dish with a tight-fitting lid. 2. Cook in oven for 5 hours. No stirring necessary! My AWARD–WINNING chili recipe will set your guests ablaze with compliments to you, the chef. This chili will probably also set your tummy on fire, because if there’s a way to add spice to a dish, I’ll sneak more in when nobody’s looking. In 2005, the company I was working for had a chili cook-off. My pot won the gold. Then two more awards again in 2014. Spoons and bowls above the rest. Try one bowl and you’ll see. PS ~ Did you catch this is an award-winning recipe? ♥ Mmmmm… Beer! Mom always preferred Pearl Light beer. She’d salt a lemon ~ sometimes a lime ~ and drop it on in. I usually use Miller Lite when I’m cooking at home. Read more about beer and how to make beer bread here! 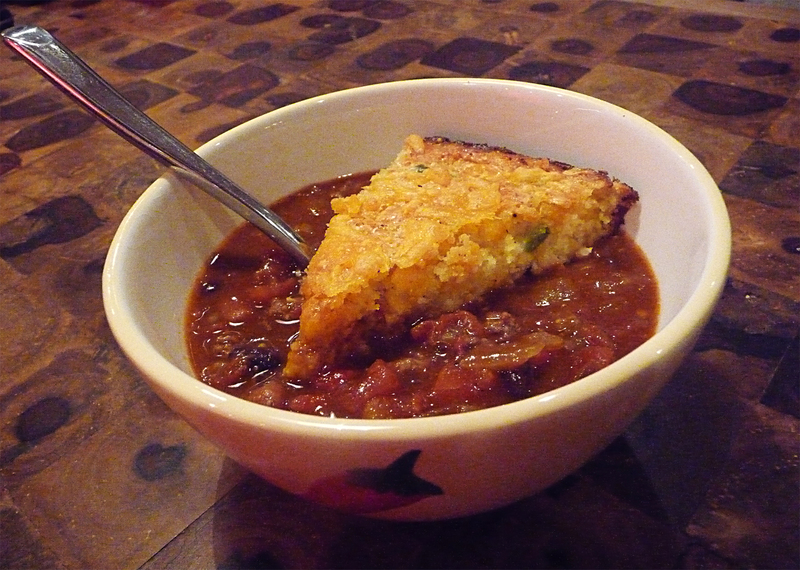 ♥ This is a great dish that’s served well with saltines, fritos or my jalapeño and cheese cornbread. 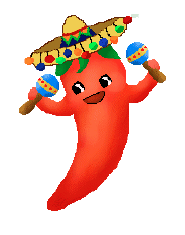 ♥ Chili Lover? Check out this second chili recipe here at Betty’s Cook Nook. It’s a sweeter bowl of red that calls for no beans. Gasp! 1. Melt butter in a large saucepan over medium heat. Add onions and garlic, cook 5 minutes, stirring often. 2. Add ground beef and cook until well done. Add the next 5 ingredients and cook 4 minutes. 3. Add the next 5 ingredients. Bring to boil. Reduce heat and simmer uncovered for about 30 minutes. Stir occasionally. Add in the beans and cook for an additional 30 minutes or until thick. 4. Side ingredients can include: crackers, corn chips, white tortilla chips, cheese (sharp cheddar/pepper jack works good), fresh jalapeños and sour cream.